Reef Name: Barracuda | Reef Depth: 60 – 130+ | Average Current: Strong | Level: Expert | Description: The current here can be very strong, making this dive only for the expert diver. Coral is pristine and healthy and larger marine life can be spotted in the area. Don’t miss the boat, next stop Cuba! Reef Name: San Juan | Reef Depth: 40-60 | Average Current: Strong | Level: Advanced | Description: This is an absolutely beautiful dive. I like to think of it as drift diving over a Scottish Moor with the very colorful and healthy coral. The current can be strong here as well, so this dive is reserved for advanced divers. Reef Name: Villa Blanca Shallows | Reef Depth: 15-40 | Average Current: Moderate | Level: Novice | Description: Villa Blanca shallows can be accessed by beach and makes a great shore dive day or night. Seahorses are an easy find here. – – – – Reef Name: Villa Blanca Wall | Reef Depth: 50 – 130+ | Average Current: Moderate to Strong | Level: Intermediate | Description: Great for a second dive this wall is best between 50 and 70 feet. Angelfish, butterflyfish and schools of jacks are common sightings. Reef Name: Paradise “wall” | Reef Depth: 15-30 | Average Current: Mild | Level: Novice | Description: Great shore dive and training dive location. I jokingly refer to this as Paradise “wall” because there is a 10 foot drop off creating a mini wall that is full of marine life. Great spot for snorkeling and night dives from the shore. – – – – Reef Name: Paradise | Reef Depth: 30-45 | Average Current: Mild | Level: Novice | Description: Abundant marine life makes this a great second dive as well as night dive location and snorkel spot. Splendid toadfish, spotted drums and lobster inhabit this reef. Reef Name: Las Palmas | Reef Depth: 40 – 130+ | Average Current: Moderate | Level: Intermediate | Description: Lots of critters to be found here, but this dive is best between 40 to 65 feet where you can see many lobster, toadfish, dog snappers, and even seahorses! This can be a shallow dive or you can drift along the wall and both are equally great dives. Reef Name: Chankanaab | Reef Depth: 30-45 | Average Current: Mild | Level: Novice | Description: This makes a great shallow second dive. Abundant marine life and large lobster can be found here. Makes a great night dive as well. Reef Name: Tormentos | Reef Depth: 50-70 | Average Current: Mild to Moderate | Level: Novice | Description: The white sandy bottom turns this into an underwater paradise with colorful sponges, schools of wrasse, snapper, and grunts. Also pikeblennies can be found popping out of the sand. One of my favorites for photography. Reef Name: Yucab | Reef Depth: 35-60 | Average Current: Moderate | Level: Novice | Description: One of my personal favorites with beautiful sponges, sea fans and a great variety of marine life. Seahorses, splendid toadfish, damsels and lobster are waiting for you here. —- Reef Name: Yucab Wall | Reef Depth: 60 – 130+ | Average Current: Strong | Level: Advanced | Description: Nice wall dive for those who like to fly. The current can be very strong here but you’ll also see big sponges and healthy coral formations. Reef Name: Punta Tunich Wall | Reef Depth: 35 – 130+ | Average Current: Strong | Level: Advanced | Description: Another dive for those who like to fly. The current is almost always very strong here, but if you get the chance to slow down, you’ll see eel, lobster, and large marine life off the wall. Reef Name: San Francisco Wall | Reef Depth: 30 – 130+ | Average Current: Moderate to Strong | Level: Intermediate | Description: Best between 30 and 60 feet. Great for a second dive. Large marine life including Eagle rays and grouper can often be seen off the wall here. Other common sightings are eel, splendid toadfish (endemic to Cozumel) and of course many other things. Reef Name: Santa Rosa Shallows | Reef Depth: 30-50 | Average Current: Mild | Level: Novice | Description: Finish off your wall dive here or begin a shallow dive here. Scattered coral heads full of marine life in a white sandy bottom make this another paradise. Don’t forget to check out the sand, flounders are abundant in this area. —- Reef Name: Santa Rosa Wall | Reef Depth: 30 – 130+ | Average Current: Moderate to Strong | Level: Intermediate | Description: Absolutely one of my favorite wall dives. Dramatic coral formations with beautiful swim throughs, best between 40 and 80 feet. Blackcap Basslets can always be found in the recesses of the coral and in the caverns. Larger marine life can be seen off the wall including Eagle Rays, Grouper, and sharks. Reef Name: Paso del Cedral | Reef Depth: 35-60 | Average Current: Moderate to Strong | Level: Intermediate | Description: Nice cavern swim throughs on this dive. This site is full of groupers and barracudas as well as frequent nurse shark and turtle sightings. This dive is not to be missed and is one of my favorite second dives. —- Reef Name: Cedral Wall | Reef Depth: 45 – 130+ | Average Current: Strong | Level: Intermediate | Description: Strong currents make this an advanced dive. If you want to relax and fly, this is a good place for it! Reef Name: Dalila | Reef Depth: 40-60 | Average Current: Moderate | Level: Novice | Description: Ocean triggers, Queen triggers Angels and snapper fill this reef. Crustaceans such as king crab and lobster are also abundant here. Another great dive for photos. Reef Name: La Francesa | Reef Depth: 40-60 | Average Current: Moderate | Level: Novice | Description: A great photo dive with colorful sponges, gorgonians, and queen angels as well as colorful schools of grunts, wrasse, and snapper. Nurse sharks are frequent here too. Great second dive! Reef Name: Palancar Gardens | Reef Depth: 20 – 130+ | Average Current: Moderate | Level: Novice | Description: This is one of the most popular dives in Cozumel and is best between 30 and 90 feet. Nice swim throughs and majestic coral heads are the key features of this dive. Excellent video and photo opportunities at the end of this dive. Reef Name: Palancar Horseshoe | Reef Depth: 25 – 130+ | Average Current: Moderate | Level: Intermediate | Description: This dive is best between 25 and 90 feet. Giant coral formations, gorgonians, grouper and sea turtles are the highlights of this dive. This site gets its name from a swim through shaped like a horseshoe. Reef Name: Palancar Caves | Reef Depth: 20 -100+ | Average Current: Moderate | Level: Intermediate | Description: If video is your thing, this is a dive for you! Dramatic coral formations like a mountain range under the sea make this a breathtaking dive. Some incredible cavern swim throughs are also highlights of this dive. Watch for sea turtles too! Reef Name: Columbia Shallows | Reef Depth: 20-40 | Average Current: Mild | Level: Novice | Description: This site is great for snorkeling or a shallow second dive. LOTS of fish such as grunts, snappers, wrasse and barracuda and nurse sharks. Spotted morays, sea turtles and grouper are also common here. —- Reef Name: Columbia Deep | Reef Depth: 60 -130+ | Average Current: Moderate to Strong | Level: Advanced | Description: A breathtaking dive with mountainous coral formations and a sloping white sandy bottom make you feel like you are in the rocky mountains, but floating through the water. Another dive full of video and photo opportunities that you’ve only seen in magazines! Larger marine life such as eagle rays, sea turtles, grouper and sharks can be seen in the blue waters. 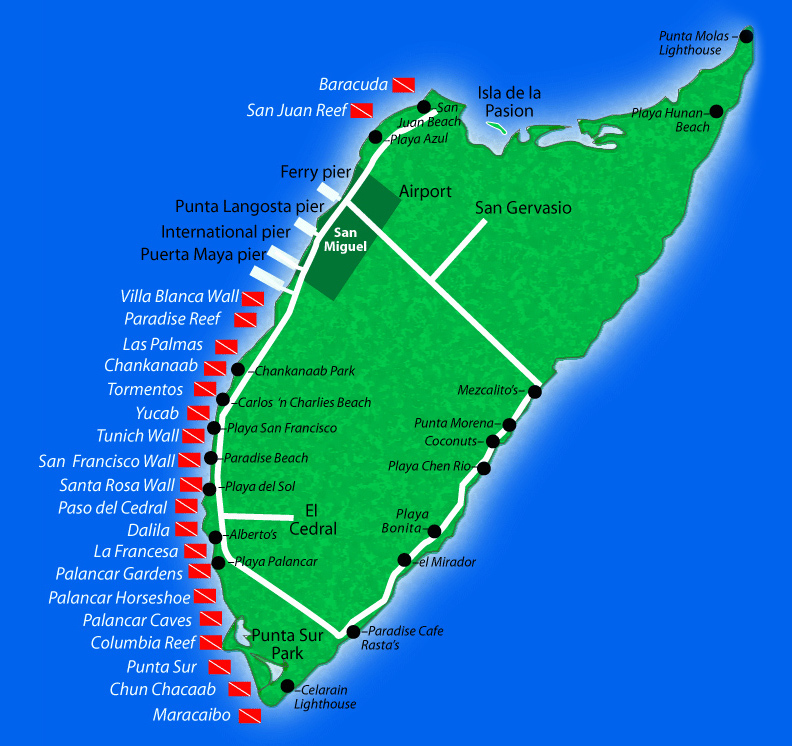 Reef Name: Punta Sur | Reef Depth: 80-130+ | Average Current: Moderate to Strong | Level: Advanced | Description: Home of the famous “Devil’s Throat” and the “Cross” in the “Cathedral.” Majestic coral formations and a giant cathedral-like cavern give the nickname “Cathedral” to this site. This is a deep and advanced dive. Computers, good air consumption and buoyancy control are important on this dive. But don’t be alarmed, it’s not as scary as it sounds! Reef Name: Chun Chacab | Reef Depth: 50-80 | Average Current: Moderate | Level: Intermediate | Description: One of the healthiest fields of seafans and sponges in the Cozumel reef system. Large marine life can often be seen here as well. Reef Name: Maracaibo Shallows | Reef Depth: 70-90 | Average Current: Moderate to Strong | Level: Advanced | Description: Giant green morays and sea turtles are the highlights here. I like to spend a few minutes here after diving the wall before ascending for a long safety stop. —- Reef Name: Maracaibo | Reef Depth: 90 – 130+ | Average Current: Moderate to Strong | Level: Expert | Description: One of my favorites, but only for the expert diver. This incredibly healthy wall is deep, beginning at 90′ with a swift current due to the directional split of the ocean here. Hammerheads, reef sharks, turtles, large grouper and eagle rays are often seen on this dive.